Russian Foreign Minister Sergey Lavrov and US Secretary of State John Kerry have stated that there is progress in Syria peace talks after a meeting in Vienna, also saying that the powers there agreed to turn the Syria truce into a real ceasefire. "We pledged our support for transforming the cessation of hostilities into a comprehensive ceasefire. We are committed to use our influence, to use the parties to [push for] cessation in order to ensure compliance," Kerry said. Kerry also announced that the ISSG sees progress in the situation, stating, however, that specific actions should be taken to make real changes. “We moved the ball forward. [But] to make all of this more than words on a page, some determined actions will have to be taken to make it happen. No one can be remotely satisfied with the situation in Syria,” Kerry said. Lavrov said that the level of violence on the ground in Syria has gone down significantly, while humanitarian access has improved in many parts of the country. As for the political process, Lavrov noted that there had been another round of talks concerning the political transition, giving the grounds for another meeting. Kerry outlined the areas that the group will focus its actions in the near future, particularly intensifying efforts to make warring parties stop all violence and disassociate themselves from Islamic State and Al Nusra extremists. The agenda also includes expanding the delivery of humanitarian aid and facilitating agreements between various sides in Syria for the mutual release of detainees. The secretary of state also noted that the peace process was endangered by “bad actors,” or parties who pledge support for the cessation of hostilities and at the same time ally themselves with violent factions when they choose to. “The peace is endangered by irresponsible actions of those who seek a different outcome [to the peace process]. They’re actors on both sides,” Kerry said. He said the members of the ISSG agreed that if a party to the cessation of hostilities does not comply, it can be reported to the monitoring group and be excluded from the peace process. “In order to bring an end to the conflict in Syria, those involved in the conflict, with conflicting agendas, will have to prioritize peace,” Kerry added. 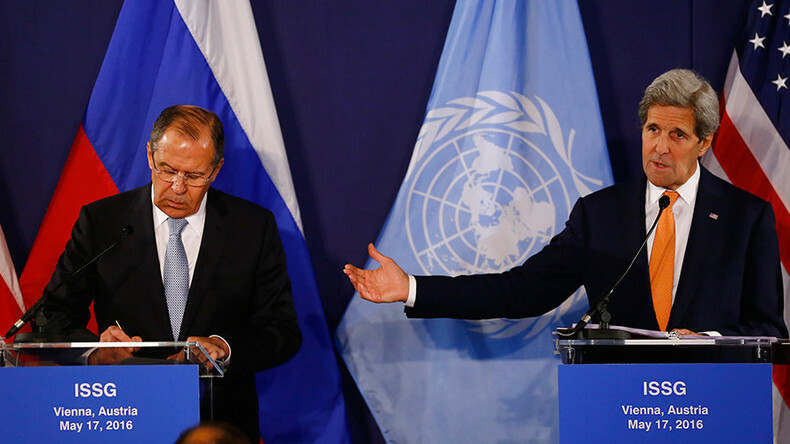 The powers in Vienna, however, failed to agree on a new date for peace talks between the warring sides in Syria, Staffan de Mistura, the UN special envoy to the country, said in a joint press conference with Kerry and Lavrov. “Intra-Syria talks are still in progress,” De Mistura said. “The issue is still waiting for some type of concrete outcome of this meeting, but we cannot wait too long, we want to keep the momentum.” He added that peace talks “will become credible when there is credible cessation of hostilities and credible humanitarian aid” delivery. #mistura finishes up saying that humanitarian crisis must be a priority. Backs up what #Kerry had said about air drops to stricken areas. Tuesday’s talks authorized air drops to improve the humanitarian situation and outlined the locations where aid deliveries are to be made. The meeting of the ISSG group lasted for over five hours. Previously, ISSG members met in Munich, Germany, in February. At that time, the various sides agreed to work for a reduction of violence in the region, which is supposed to turn into a full ceasefire within a week’s time. The truce, however, does not include organizations which are considered terrorists by the UN Security Council.